Did you know it’s creator owned comic’s day? Neither did I till I I checked twitter. But it is! And since my article on the art industry being not all sunshine and rainbows right now is being thwarted by my muse that is drowning in research taking much longer than I had ever anticipated, let’s celebrate with some webcomics you can read right now. A classic. 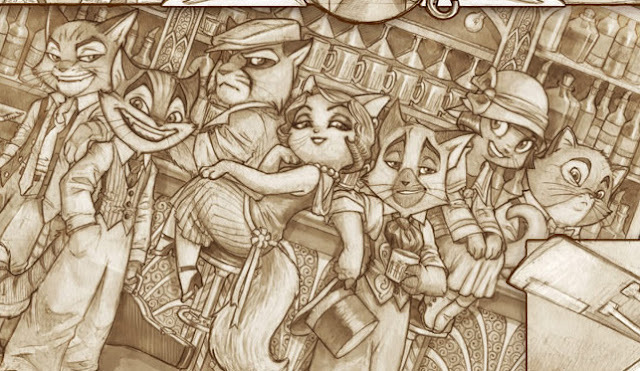 Tracy J. Butler’s Lackadaisy (our header!) combines cats with prohibition era 1927 St. Luis. Cats, liquor, jazz, hijinks, what more could you want? Steampunk! Difference engines! Crime fighting! Math! The Queen! Poetry no Ada forbids poetry! 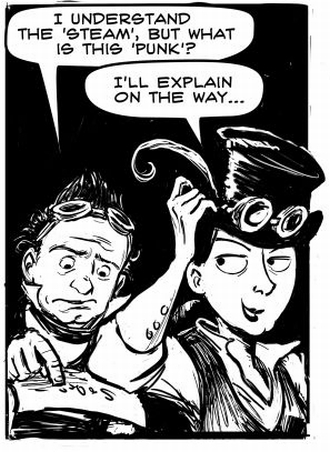 Enter the world of Sydney Padua’s exciting tales of real life geniuses Charles Babbage and Ada Lovelace. The duo go on a number of outlandish adventures and solve a myriad of mysteries in Victorian England, all in the name of progress. Tony Cliff's Delilah Dirk and the Turkish Lieutenant is a full realized graphic novel for you to real that chronicles the misadventures of one Delilah Dirk; thief , and her unusual companion Mr. Salim, a Turkish Lieutenant. The story follows the two as they dodge the law, hoodwink fellow thieves, and travel far and wide. Burn is pretty new, and by pretty new I mean “today” new. It’s the lovechild of writer, penciler and letter Marcus Schultz and inker Malcolm Johnson. 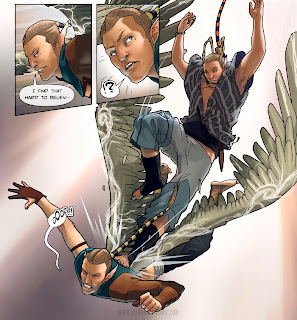 The comic itself is a testament to the ability to collaborate online as Schultz hails from Perth, Australia and Johnson is currently in San Francisco. Billed as a love story, I’m sure it’s bound to have some creepy quirks as the duo both enjoy their fair share of the horror genre, and the first few pages certainly lean towards an other wordly tale. Spindrift tells the tale of Morwenna, a half-breed blacksmith living in the racially pure city of Aureate, where the purebred Alar citizens fly about on mystical wings. But when Morwenna's father, a deposed nobleman of the war-loving Ildrei race, learns of her existence, he schemes to learn the secret of the Alar wings and sets in motion a series of events with tragic consequences not only for Morwenna, but the Alar as well. We reviewed these guys some time ago but they are back with their second installment (and fresh off a vary successful Kickstarter run). Ultrasylvania Vol 2: Emperor Frankenstein has a new set of artists bringing Brian Schirmer’s script to life, including some very talented ladies! The story, often explained as “Game of Thrones with classic monsters” is deepening as tension rises between the nations and new monsters are introduced and the plot thickens. Berds and Nerds is also a newer comic by artist Sarah Yoshi and M. Soho. It's only a few strips in but their cookie strip is pretty inspired. You can't not have this on the list. Kate Beaton's Hark! A Vagrant! is a staple of web comics. One part historical, one part ridiculous, the comic covers everything from Beaton making fun of herself to Marie Antoinette. Of course this is just the tip of the iceberg. There is so much more in the world of creator owned comics, both printed and web. So go forth! Read! Support! Asher Powell’s oldest memories are reruns of the Adam West Batman show. By day she is a mild mannered geek wielding an art degree and a heavy caffeine addiction, but by night she is known as a writer who’s work has been featured on Autostraddle and Bleeding Cool. You can follow her on twitter where she rambles about the nerdier side of pop culture as well as her kitties and what she’s procrastinating on. Yay! I've read Spindrift but not the others. I found Namesake too. I liked that one.